For Mame Biram Diouf, the road to the Bundesliga and Hannover 96 began with a move from ASC Diaraf in his home city of Dakar, Senegal, to Norway's Molde FK in 2007. He was 19 at the time. His scoring exploits, first helping Molde earn promotion and subsequently in the Norwegian top flight, swiftly attracted the interest of a number of bigger clubs around Europe and in July 2009 he agreed terms with Manchester United on a deal to commence the following January. After spending 2010/11 on loan at Blackburn Rovers, Diouf returned to United for a further half-season. Then Hannover came calling and, during the 2011/12 winter transfer window, he made the switch to the German game. Signed up with the 96ers on a two-year contract, the powerful and mobile forward wasted no time making his presence felt. He bagged his first goal in a 4-2 victory over Stuttgart and finished his debut half-season in Lower Saxony with an excellent return of six, and three assists, in only ten Bundesliga outings. Four more goals in five Europa League matches confirmed that Hannover coach Mirko Slomka and sporting director Jörg Schmadtke had conducted another canny bit of business. 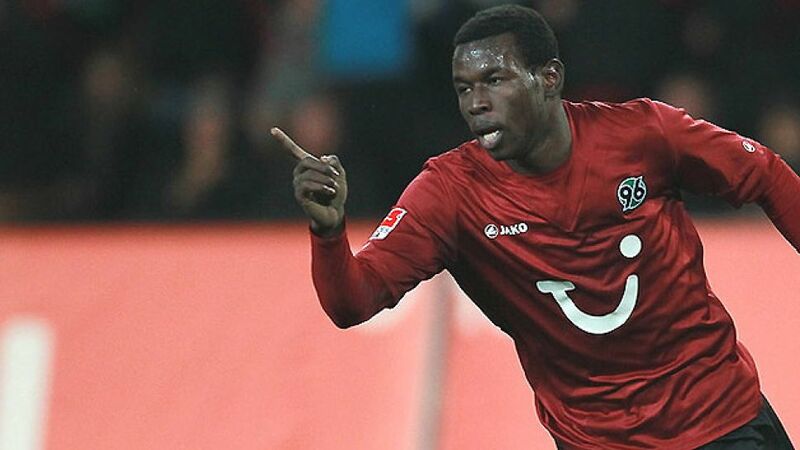 Alongside Ivorian international Didier Ya Konan and Oslo-born goalgetter Mohammed Abedellaoue, Diouf was one third of a trio of Hannover players to have had their first taste of the professional European game in Norway, a connection that served both the back-flipping frontman and the Reds well as he slotted seamlessly into Mirko Slomka's system. The striker maintained his momentum going into 2012/13, finishing as Hannover's top scorer bagging twelve goals and providing seven assists in the process. Scoring a goal every other game wasn't enough to keep the Reds in the UEFA Europa League, however, his performances are just further proof of the Scandinavian country's Tippaligaen being a made-to-measure staging post for emerging talents on the way to the Bundesliga.